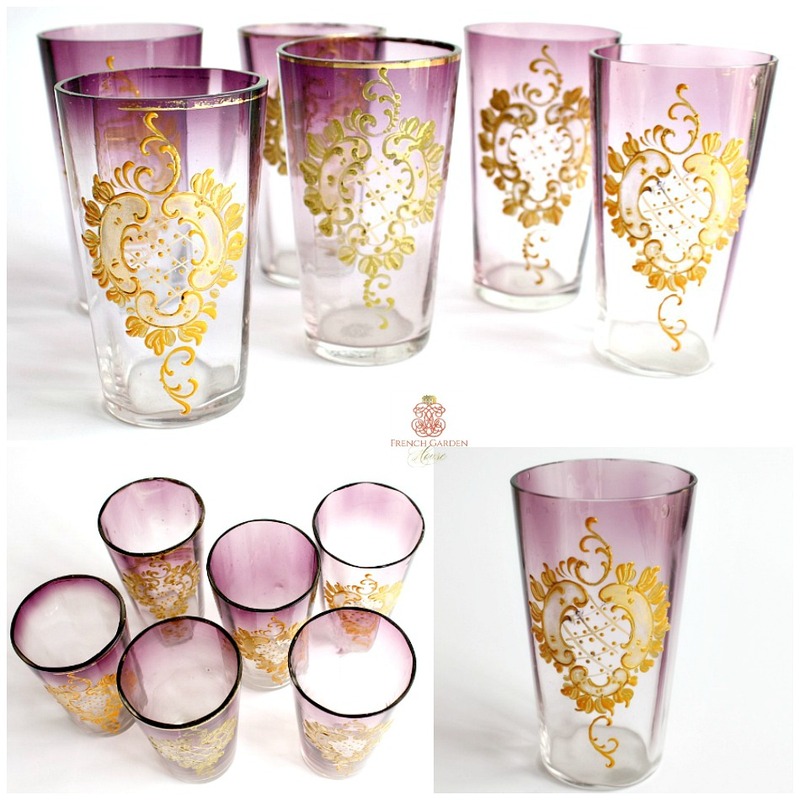 A fabulous 19th century set of six Moser aperitif or wine tumblers in the traditional mid 1800's timbale form, elegantly hand painted with applied gilded work on paneled glass that flows from clear to purple. Decorative, these are gorgeous little gems, each collectible glass has hand painted scroll design and gilt enameling, very elegant and the height of luxury. Beautiful to dress up your table or to display in your lighted display cabinet with your antique glass collection. These are truly works of art, they are translucent and lightweight, with some bubbles to the glass, what you expect for antique hand blown pieces. 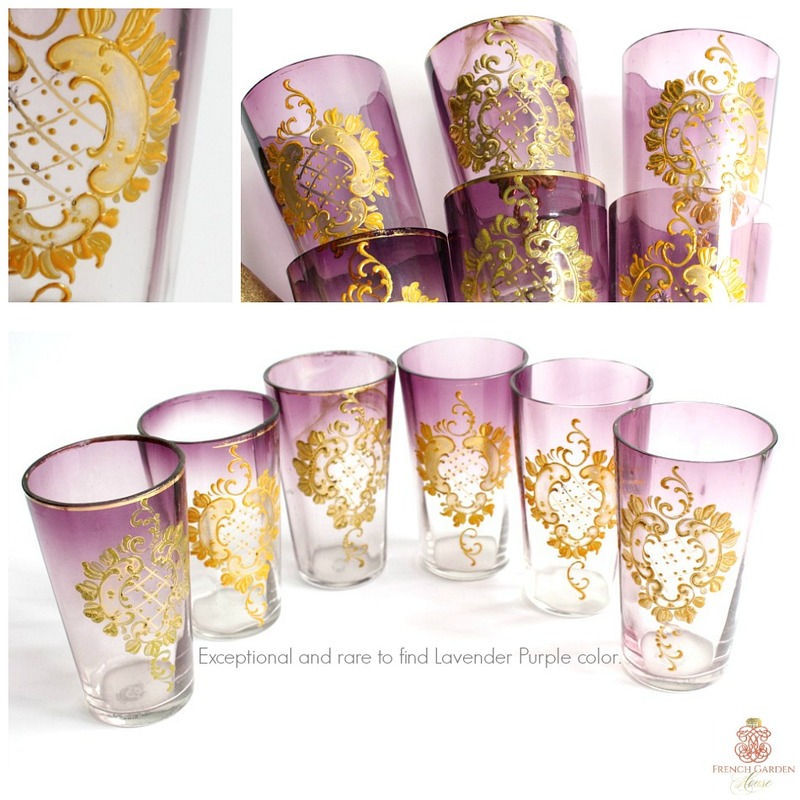 The lustrous lavender purple color will thrill the collector. There is wear to the gilt trim on the very top, some of the glasses don't have a trace, while some do. The gilt decorations on four of them are slightly different than on the other two, perhaps this is a set collected over time. One has a small inside rim chip. 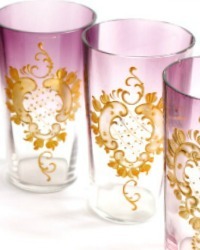 Some are marked Moser M M Glasfabrik Karlsbad Austria, and have the artist signature in gilt. Measure 3-3/4"h x 2-1/8" diameter.